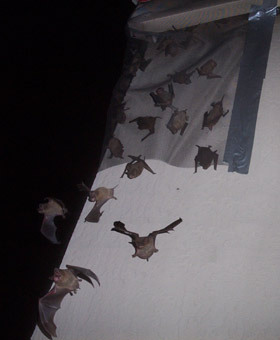 Bat Control Orlando: This is what we specialize in - the safe and humane removal of colonies of bats from buildings. Bats, by nature, seek out dark crevices to roost in during the day, before they emerge at night to forage for insects. However, certain species of bats form what are called maternity colonies: these are large groups of female bats that live together and bear and raise their young in a group. A maternity colony needs a large area to roost in, and preferably a hot one. These bats love to live in buildings, usually up in the warm attic or roof space, or under barrel tiles. Large colonies of bats such as these are protected by state law. However, it is of course legal to safely remove them from a building - they just can't be killed. We safely remove all the bats, with a 100% success rate, bat-proof the building, and give a guarantee on our work. I operate a professional wildlife removal business in Orlando Florida. It is not a pest control or extermination company, nor is it the county animal control. It is a privately owned nuisance critter and wildlife control business. For more company information, just browse this site. For more bat control information, go back to the Florida bat control page. If you don't live in Florida, click here for the National Directory of Wildlife Trappers.